Based on Powell’s most recent speech and policy trial balloons floated in the media, the fed funds rate is now much closer to the expected rate of economic growth, therefore it is much closer to what is known as the neutral fed funds rate. As a result, future Fed rate moves are expected to be increasingly influenced by incoming economic data. If true, this change in monetary policy posture is one to which the market is far less accustomed. In less than two months, the Fed Chairman’s perspective about the proximity of the fed funds rate to neutral shifted from a “long way” to “just below.” Clearly, something in Mr. Powell’s assessment shifted radically. We have some thoughts about what it might be, but we decided to canvas the opinions of others first. 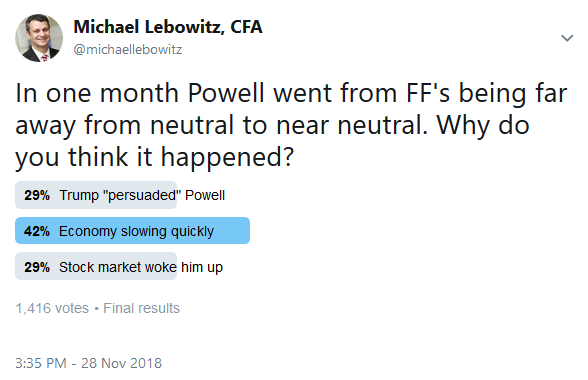 We created a Twitter poll to gauge our follower’s thoughts on Powell’s pivot, which came despite very little evidence that economic conditions have meaningfully changed in the interim. The poll results from over 1,400 respondents are telling. Accordingly, we provide a brief discussion of the respective implications for monetary policy and the stock market. 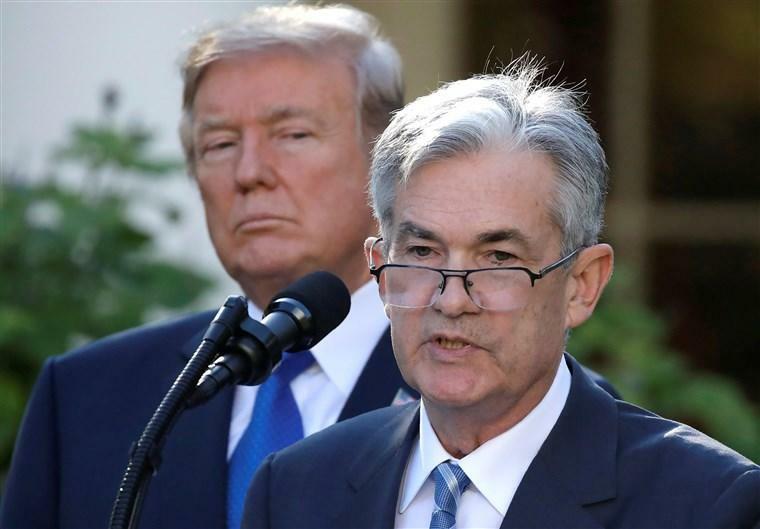 WSJ 10/23/2018– “Every time we do something great, he raises the interest rates,” Mr. Trump said, adding that Mr. Powell “almost looks like he’s happy raising interest rates.” The president declined to elaborate, and a spokeswoman for the Fed declined to comment. — Asked an open-ended question about what he viewed as the biggest risks to the economy, Mr. Trump gave a single answer: the Fed. The Fed is under increasing pressure from the White House to halt interest rate hikes. While we like to think Fed independence means something and the President’s pressure is therefore futile, there is a long history of Presidents taking explicit steps to influence the Fed and alter their actions. 29% of poll respondents believe that Trump’s comments made in the open, and those we are not privy to, are the cause for Powell’s change in tone. If this is the case, it likely means that Powell will shift towards a more dovish monetary policy going forward. This would entail fewer rate hikes and a reduced pace of Fed balance sheet normalization. Since the financial crisis, the precise combination of low interest rates and expanded balance sheet (QE) has proven extremely beneficial for stocks. Looking forward, excessive monetary policy amid a smoothly running economy is a recipe for inflation or other excesses which would not bode well for stocks. We think this scenario is short-term bullish, but it could easily be diminished by higher interest rates or growing inflationary pressures. Before moving on, it is important to note that Trump’s remarks above (and many other of his comments) are a first of their kind. This isn’t, because other Presidents haven’t said similar things but because Trump’s comments are in the public for all to see. Votes that a quickly slowing economy produced Powell’s shift represented 42% of all responses. If correct, this is the worst case scenario for the stock market. Global economic growth is already decelerating as witnessed by the declining GDP growth posted by Germany, Canada, Italy, Japan and Switzerland in the most recent quarter. Further, China, the main engine for global economic growth since the financial crisis, is sputtering. In addition to the global forces affecting the economy, the growth benefits seen over the last year from a massive surge in fiscal spending and corporate tax cuts are waning. Lastly, higher interest rates are indeed taking their toll on our debt-burdened economy. It goes without saying that stocks tend to do very poorly during recessions, regardless of whether the Fed is dovish and lowering rates. During the past two recessions, the S&P 500 dropped over 50% despite aggressive interest rate cuts. We think this scenario is decidedly bearish. The “Greenspan Put” is a phrase that was used to describe Fed Chairman Alan Greenspan’s preemptive policy moves to save the stock market when it was headed lower. While Greenspan’s name is on the term, it goes back even further. Following the crash of 1929, for instance, the Fed made enormous efforts to halt stock market declines to no avail. In recent years, the Greenspan Put has taken on more significance as Ben Bernanke and Janet Yellen followed in his footsteps and spoken repeatedly about a beneficial wealth effect caused by higher share prices. In the past, Powell has expressed reservations about the policy measures taken by his predecessors and has openly worried about the risk of high stock valuations and other potential imbalances. He has generally demonstrated less concern for protecting the stock market. With the market falling and the proverbial rubber hitting the road, we are about to find out if a 10% decline from record highs is enough to scare Powell into a dovish stance. If so the Greenspan, Bernanke, Yellen, Powell put is alive and well. As previously mentioned, there have been several occasions in years past when the market suffered steep declines despite the presence of the Fed Put. We think this scenario is bullish on the margin, but it may not be enough to save the market. As judged by the voting, the most likely explanation accounting for Powell’s sudden and aggressive change in tone involves some combination of all three factors. Like most central bankers, he probably believes that he can engineer a “soft landing.” In other words, he can allow the current global and domestic economic pressures to reduce economic growth without causing a recession. While such a plan sounds ideal, the ability to execute a soft landing has eluded central bankers for decades. Some will say the Fed, by delaying plans for rate hikes and reducing their balance sheet, avoided a hard landing in 2015 and 2016. They may have, but since then global economic and political instabilities have risen markedly. This makes a repeat execution of a soft landing much more difficult. A second concern is that the Fed, with rates still historically very low, does not have enough fire power to engineer a soft landing. We will continue to pay close attention to the Fed for their reaction to what increasingly looks like a changing economic environment. We also leave you with a reminder that, while the Fed is powerful in igniting or extinguishing economic activity, they are simply one of many factors and quite often throughout their 105-year history they have fallen well short of their goals. The market is a highly complex global system influenced more by the unseen than by the obvious. Jay Powell, like most of his predecessors who thought they could control market outcomes, apparently suffers from this same critical handicap. Of all the moral hazards the Fed sponsors, their hubris is certainly the most destructive. The stability of the last ten years and the shared perception of Fed control will lead many to forget the sheer panic that occurred only a decade ago.